Ai Editorial: More clicks = more confusion = no confidence in a travel booking! Checking OTA sites, brand.com, review sites and repeating the process to verify the authenticity of whatever is being offered is quite common among travellers. · Inconsistent chatbot: It isn’t uncommon to receive an email for completing an unfinished booking. Returning to where you left off and completing a booking in a couple of clicks or even clearing any doubt via a chatbot is fine, but what if the chatbot fails? 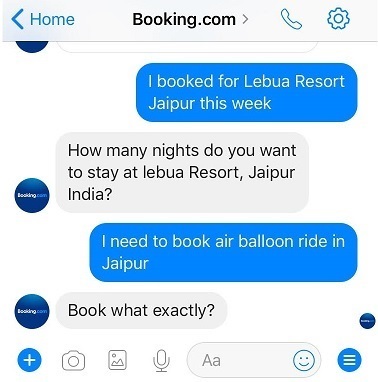 In case of booking.com, one click facilitated by an email takes to Booking.com Facebook chatbot. But the chatbot failed on two occasions for two different bookings. Even if the user provides the same information (for example, package for 3 nights from March 23rd, 2016 for two adults and one child 11 years, Novotel Goa Resort and Spa) for the same property that wasn’t booked, then also the chatbot returns “Oops, this invitation is invalid” message. On another occasion, it did provide with the visual of the property and key information (such as price, ratings, reviews and picture of the room). Booking can be finished in a couple of minutes. But there are times when the chatbot also showed inconsistency, returned results for a property in another country. On repeated attempts it did work but that might not be the case with every traveller. - Don’t be surprised if the chatbot isn’t able to recognize a booking that a user has completed (whose name chatbot is aware of and the app is also installed on the same device). - All talk around targeting the “second wallet” needs introspection. Even if the user checks the possibility of an in-trip excursion post a booking, the chatbot is clueless. - If a search engine can understand certain keywords, why does the chatbot fail miserably on this count? This doesnt sound a customer-centric proposition especially when chabots are being prepared to deliver a personalised service. At a time, when travel marketers are contemplating how to be in control of every click or interaction, even that is taking place on 3rd party platforms, this state of affairs is indicates the level for scope for improvement. · Irrelevant messaging: A booking completed via an OTA, and still coming across sponsored links for returning to the booking path is a possibility. When travel e-commerce players, especially OTAs, are sending emails after every abandoned session, why aren’t they ready to make the most of the interaction made for a specific booking or even based on bookings in the past? For instance, the likes of Booking.com need to go beyond an offering like discount that can be availed by their regular buyers (“genius” bookers). A traveller, who has travelled more than 5 times in one year and booked with family members (looking at specific category of hotels/ resorts, certain type of rooms etc. ), can be recommended with options rather filling same options again and again. So, for instance, once an indication about a destination is given along with the dates, then why not to come up with curated options? Every piece of communication or offer should be about making the user do less and bridging the gap between planning and booking. But, as of now, the options are too broad and leaving room for confusion or too much search on the part of the traveller. · Ambiguity about value: Comparison shopping is inevitable. Hotels, even the established chains, don’t give much confidence to shoppers at times. For the same property (Novotel Goa Resorts and Spa), both on the hotel site and OTA.com, there is a category of room that apparently has a staircase (indicating separate living room and bedroom) but there is no video or virtual imagery on the hotel site that can confirm the same. Even a call to the call centre at the time of booking isn’t sufficient. Only the property can confirm the details about the room. Similarly, in case of booking.com, if you book for 2 adults plus 1 child with breakfast included, there is no clarity whether the hotel/ chain would end up charging for the child’s breakfast or not. The industry needs to counter certain issues that are related to content and technology that can prolong the booking procedure. Dropping off again, even when the intent is to book or complete a transaction isn’t a good sign. Also, when travellers are inclined to use a certain channel for a booking, why not make the most of this opportunity by showing content and consequently booking options that complement the other aspects of the trip. Retargeting without sharp, precise messaging or friction-filled booking needs to be taken care of. 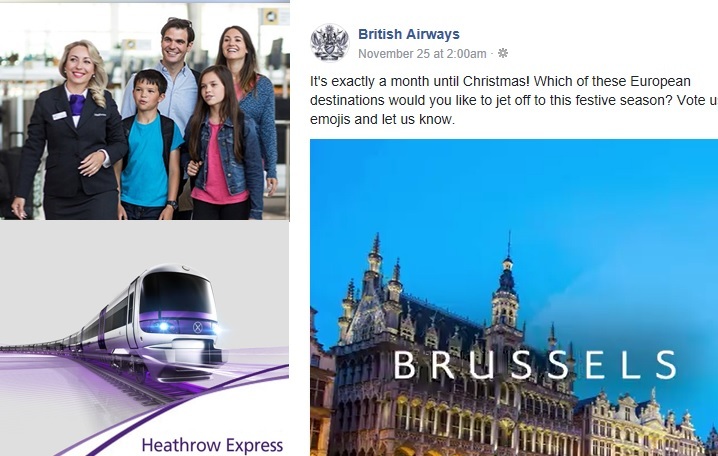 Ai Editorial: Doing away with “search” on a travel ecommerce site - is it the next holy grail? The gap between what and where to book to finally completing a transaction for a trip is rather a prolonged one, fragmented over sessions, devices etc. The tussle to overcome this challenge is an interesting one, and as we approach the end of 2017 certain interesting possibilities are cropping up. One of them is related to doing away with the “search” functionality on OTA.com, a meta-search site or airline.com. Targeting travellers early in the booking funnel and monetizing every user who ends up using an airline’s digital assets is increasingly gaining significance, but the fact remains that evaluating options remains a core issue. Why one really needs to share starting point and the end point of a journey to book an airline ticket? This aspect where one has to identify a destination and then further search for fares or offers around it is being questioned. During the recently held, Ai’s MegaEvent in Palm Springs, California, this issue of making a customer search first and then book was discussed. Imagine, for first time traveller, who is trying to stay in Windsor, UK – how challenging is it for him to evaluate – how far a hotel is going to be and how to arrive from Gatwick, Luton, Heathrow or Stansted? So tabs featuring dates and location (from and to), the functionalities shouldn’t be about making users to do more – for instance, first think of what to do, then search, then choose from a selection of options etc. Planning a trip (be it for finalising a destination or a trip or selecting a flight or a room etc.) should be less tedious. “When system works a certain way, we try and make users work the same way. That’s natural way of thinking (sticking to the same pattern of search). But that doesn’t mean something novel or nifty can’t be built around it (a prime example of the latter is what meta-search engines have done around search). There is room for plenty of innovation that can be done if one of the variables is changed around how search is being done...how it happens in the background probably wouldn’t change for next 10 years. But how the user interacts/ uses can be changed, the moments of inspiration, what the moments of transaction…can be altered,” pointed out Kevin O’Shaughnessy, CEO and co-founder, Indigo.gt. “In a nutshell, start building loyalty and customer service before the booking even starts, not after. It will help differentiate from the get-go,” he said. There have been specialists that are focusing on recommendations (could be based on content, for instance, matches with a traveller loves to do or use their knowledge of a particular city and assess what’s similar in a new destination they would probably visit). It is about taking out uncertainty as soon as possible, and quickly build affiliation with the user by offering them what they could possibly like! For instance, LikeWhere, an Irish company focuses on a specific niche of travel - personalising destination discovery. Their software analyses cities and breaks them down into neighbourhoods, and then enables airlines to match locations to the lifestyle preferences of their customers. The company validates all their data with a global network of local bloggers. “We have found to deliver a nuanced recommendation, it is essential to humanise our data, but that certainly isn’t the case across all the verticals of travel. Once we establish certain parameters with a customer we use machine learning to add value, through informing more contextual recommendations. Our product enables airlines to begin their customer lifecycle earlier in the inspiration phase which positions them for the booking/ancillaries – that’s where the monetization is,” explained Matt Walker, Chief Storyteller, LikeWhere. So how to bring in such a radical change? “Take loads of small steps and small experiments in a controlled way. Create a sandbox for quick experimentation, “fail fast, fail cheap”, work on feedback and evolve from there,” recommends O’Shaughnessy. 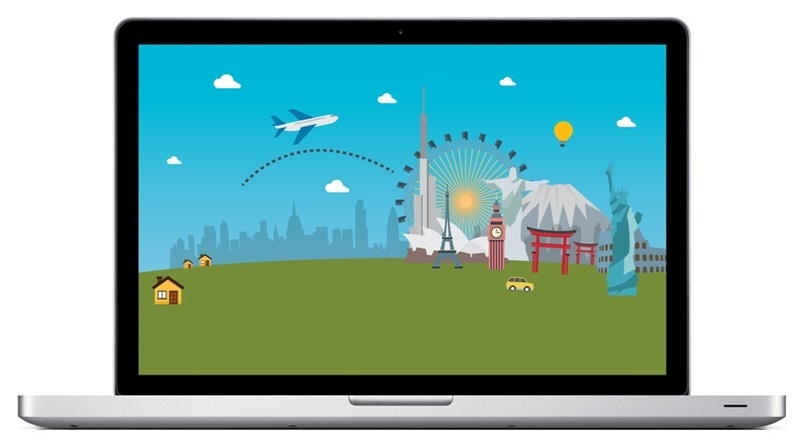 Do travellers really think of dates, destinations as they dream and plan or even book? To what extent the current way of searching is aligned with the functionalities offered? “Not necessarily (dates and location being always important). One of the traps one can fall into from the design perspective is to assume that everybody travels the same way. Think about the car sharing revolution in southern Europe – from France to Spain to Italy – according to Blablacar, this has created a net increase in mobility, rather than impacting flights and rail bookings. More travel to more destinations. Ask a travel-hungry centennial if they would prefer to travel less or more for the same budget. If one saves money, they can travel more. At the moment of transaction all flights are equal, but how you get to that transaction is as varied as people’s culture and personality,” said O’Shaughnessy. “The more service you can leverage pre-booking, the better engagement you’ll have throughout the purchase occasion. As most digital teams may not be in direct control over the “deeper” parts of the PSS’s booking flow, and it may be resistant to innovation or experimentation, pre-booking engagement is an important factor in increasing conversion. The more ways you engage with search itself “weekend search”, “saved trips”, “travel preferences for pros” and more, increases the width of your funnel to allow for a higher quality of user engagement. This can happen earlier on in the booking process,” mentioned O’Shaughnessy. “The "engine room" of search and booking may be tough to change from the outside-in. That doesn't mean that we can't experiment today with new layers which broaden the funnel and increase loyalty,” concluded O’Shaughnessy. Ai Editorial: Off-PSS for retailing, how many airlines are ready for it? Dynamic pricing, personalised offers, targeting the “second wallet”… all of this and more encompasses retailing in the travel sector today and airlines, too, are open to embracing the same. So what needs to be done for the same, say adjusting pricing as per the shift in supply and demand, a practice that is an integral part of retailing today? Of course, with certain travel technology specialists urging airlines to evolve in order to be in control of what and how they sell, the option of going “off-PSS” is being explored. No denying that as long as the majority of all the inventory is controlled the way it is being done now, there will only be change to a certain degree. So is it time to move main components - merchandising, pricing, scheduling and availability – out of the PSS in order to create an offer that is under the control of the airline? Are more and more airlines looking at adjusting their IT set up, thereby separating operational and commercial aspects of their business? Or have the likes of Amadeus and Sabre managed to catch up and set to retain their contracts signed over the years? A couple of issues are being highlighted that can’t be overlooked while drifting away from the existing IT set up in-lieu of working out an offer dynamically via addition of offerings from a 3rd party vendor. “Anything that has been done for a long period of time can be termed as legacy. So new players can find certain niche elements, and break it-off for improvement. That is how they will grow. But the original airline needs to remember – every system that is in place has a certain role to play, it is there for a reason. It is designed to work in totality with the entire product IT suite,” mentioned the executive. “Several systems talk to each other, and it works like a well-oiled machine. If you start breaking a part of it, on the narrow it looks great. At the same time, do assess what perspective you are losing.” So let’s say, there are options as far as merchandising is concerned, and a seat assignment can be handled, EMD can be issued, record a sale through the right channel etc. and a sale happened. In case, an irregular incident takes place – the plane gets delayed or flights are cancelled. Now the passenger needs to be protected on to the next flight, but is that information going to get translated into the DCS record of the passenger. So if it’s a 3rd party product, is it integrated to handle such cases or only integrated in the res system? Is the backward integration streamlined? If the airline needs to take care of the passenger manually (go into the record, what services paid for etc.) and make the adjustment, then it is an issue. “It (integration) is additional cost, and the work has to be done in case of different vendors becoming part of a suite. Do the new vendors have that level of expertise?” Considering all these factors, certain airlines are understandably averse to embracing change. For an industry that tends to prioritize safety and operations over anything else, change doesn’t come easy. Amadeus, in an interview with Ai in August this year, acknowledged that even if an airline’s IT strategy features relevant/best of breed components from a range of suppliers they are ready to support it. Overall, be it for organizational hurdles or reliance on business processes that are still based on the paper-based workflows or setting up the retail layer on top of the legacy systems, such issues can hamper the progress. So even as one talks of adjusting pricing as per the shift in supply and demand, such desired move might not be an instant possibility. There is no one process for shopping today. A request could come from any of the avenues – airline.com, meta-search, OTA, an offline travel agent…so an airline’s offer needs to be ready. The offer has to be correct, consistent - otherwise the passenger might not choose you. Processing these shopping requests has to be cost-effective, too. The look-to-book ratio has sky-rocketed over the years, and it is one component that can’t be ignored by airlines. This issue has been addressed by certain players, transforming the economics of pricing and search (supported by live-transaction and pre-computed shopping model paving for shopping accuracy, sub-second speed etc.). Also, even as airlines are being “shopped” from an increasingly number of channels and the key is to increase the percentage of that look-to-book by marginal amounts. How to achieve the same? Airlines have to be dynamic – being able to generate offers on the spot every time there is a request. The attempt is to respond in the best possible manner to every inquiry coming into an airline’s system. So the plan should be to blend booking data and offer data. Engines - merchandising, pricing, scheduling and availability –position airlines to maximize the opportunity as they are rules driven plus they also leverage predictive analytics. So it would be rules-based schedule building and off-PSS availability calculation, for example. In this context, the industry is witnessing certain players recommending PSS-agnostic connectivity with full offer and order management, and the NDC API fuelling all channels. Are airlines going to do away with their respective packaged PSS deals, deconstructing some of the key components? “Technically, anything can be de-coupled, commercial considerations or even the desire to do it can be a question mark (in case of airlines)!,” said a source. Every airline’s journey toward retailing is unique, but one question that continues to crop up is the agility of PSS. If the progress of an integrated IT suite isn’t up to the mark, then separation of operational and commercial aspects is imminent. Making the most of every digital trail for a favourable business outcome is what digital enterprises are after. But connecting the dots pertaining to a fragmented shopping journey isn’t just restricted to one organisation’s data. Of course, capitalising on the 1st party data, working out a core data asset around own transactional systems is an integral part of a connected data architecture. But what about leveraging “open innovation and open algorithms” as part of the platform strategy? For instance, a traveller is allergic to a particular food ingredient or loves a particular cuisine as per the shopping preferences logged with one retailer or within one ecosystem. Can the same traveller be served food or rather be delighted with what he loves as part of onboard flight services? If seen this way, every click or tap is an opportunity as there is data that is resulting from every interaction and experience. Of course, issues such as security, privacy, ownership of data are key considerations, but with policing and governance, entities are looking at transforming their capabilities via an astute platform strategy. The connectivity facilitated by such plug-and-play business model is paving for interactivity among the stakeholders, and resulting in exchange of “value”. Airlines, like any other business striving to embrace digital transformation, are gearing up for an API-managed environment, microservices architecture and artificial intelligence. Javornik underlined that airlines need to finalise their respective digital strategies to survive the commoditization of their core market. Digital transformation requires action on several fronts – embracing cloud native architecture for managing and running digital assets, APIs etc. So where does a platform model fits in for digital businesses in order to embrace innovation and agility? According to Javornik, the first thing to understand is that digital transformation goes really deep. · Differentiation via sharing of data and APIs: “Software does not have a physical form. In the decades of development on the market it turned out that the most efficient model to benefit from digital technology is to position it in a form of a platform that enables so called two-sided marketplace (or multi-sided marketplace). This means that you eliminate all non-IT middlemen and start customer journey with a digital system on top,” said Javornik. “In a form of a platform that connects end users to other systems that provide them important services. It is fundamentally important to understand that this is the prevailing business model that is winning today on the market. Not being fully integrated in this new ecosystem is a very dangerous strategy in my opinion. Not understanding difference in complexity and speed of this new ecosystem is a danger as well. There are no friends and enemies in this new ecosystem. Almost every other microservice in the ecosystem will be both at the same time or so called “frenemy”. Companies that will be better connected and will have ability to change business models faster, will win,” concluded Javornik. So, as Javornik, also asserts there won’t be any single customer journey. It is imperative for airlines will need to be in as many winning digitally connected ecosystems as possible, while protecting their value add on the other hand. What is the significance of being a platform-enabled retailer? Here from experts at the upcoming 8th Mega Event Worldwide, to be held in Palm Springs, CA, USA (29 November – 1 December, 2017). Ai Video: Is being process-centric really a hindrance to being a retailer? Operations and safety have always been high on the agenda of those running an airline. In this context, if airlines have rather been slow to being customer-centric and embracing data-driven retailing, it doesn’t come as a surprise. As the industry digs deeper, some pertinent questions are cropping up: how to go about organisational structure? How to combat silos and align various disciplines to serve the customers in the best possible manner? Is airline-specific technology that is used to run operations a hindrance to being a digital enterprise? Ai’s Ritesh Gupta spoke to Kevin O’Shaughnessy, CEO and co-founder, Indigo.gt about the same. Excerpts from a recent interaction between the two that took place in Bali, Indonesia. Where do travellers spend money for in-destination activities – OTA, airline.com, Airbnb, 3rd party emerging booking platforms, offline stores/ counters etc.? Monetising web or mobile traffic by selling tours, transfers, local experiences, tickets for events etc. along with dining and shopping is on the agenda of travel e-commerce players. Stepping up the average order value by capitalising on in-destination spend isn’t a random move anymore. Airlines are starting to realise the significance of curating relevant choices, right from the destinations a traveller may consider to “what to do” once its chosen, to fall in the consideration set as early as possible in the booking funnel. Website personalisation, profiling of customers etc. is coming into play as part of sophisticated retailing techniques. 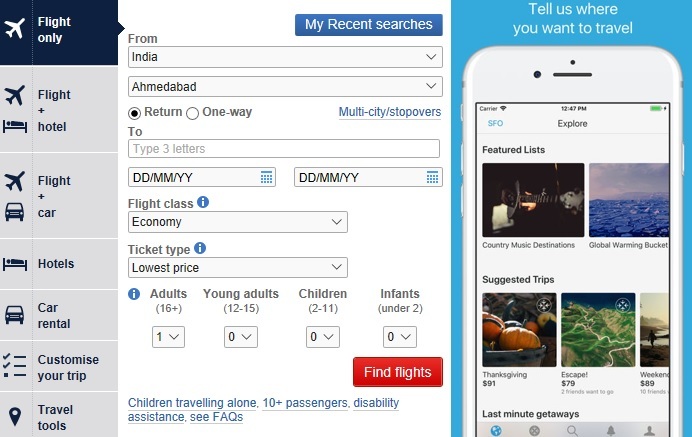 Be it for refining the booking flow or presenting content and inventory via 3rd party sites, airlines are assessing every possible opportunity to monetise the in-destination spend in a methodical way, rather than losing out to others be it for having a important say in the trip funnel or garnering incremental revenue. In this context, emerging entities like GetYourGuide are carving a niche for themselves, a sector which according to Shane Mayer, Strategic Partnerships, GetYourGuide, is evolving rapidly. The company is enabling established carriers to let travellers arrange their entire journey via them. Customers can do this weeks ahead of a trip, or even during the flight, said Mayer. Explore how airlines, intermediaries and B2B specialists are going about distribution at the upcoming 8th Mega Event Worldwide, to be held in Palm Springs, CA, USA (29 November – 1 December, 2017). Ai Editorial: Is IATA’s NDC standard maturing? Ai Editorial: What is the real utility of IATA’s NDC standard in “indirect” distribution as of today? Is the XML-based messaging standard maturing? Ai’s Ritesh Gupta examines. Questions around the progress and even the viability of NDC continue to crop up, even though the XML-based standard has been around for years now. Of course, the number of airlines associated is always under scrutiny, but the IATA asserts that the standard is progressing and “maturing”. In their recent update, the IATA referred to the progress with version PADIS 17.2 (went live last month). 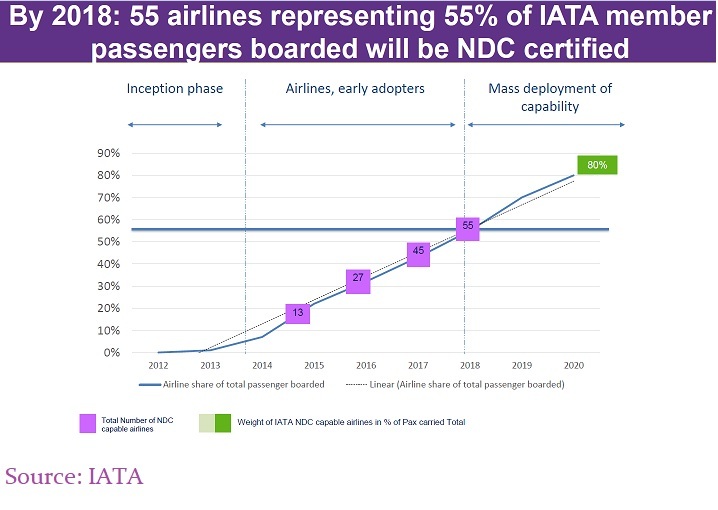 It has also been stated that by next year, 55 airlines representing 55% of IATA member passengers boarded are slated to be NDC certified. “Look at the total revenue generation (featuring NDC),” questioned one senior industry executive, who also questioned the utility of XML. Also, “too much flexibility in the initial versions of schema and continuous releases”, too, haven’t gone well with even some of the proactive players in the industry, as the standard is not only an airline topic, it does have an impact on the entire industry. What is there to be seen as a progress then? In case of certain intermediaries, say a meta-search engine, that aren’t as big as Google in terms of garnering traffic but do understand the significance of showcasing the best possible content/ deal from airlines to make comparison shopping easier, the pace with which NDC has progressed has rather been slow. They expected a lot more, still for them, NDC has failed to deliver to an extent. As Skyscanner acknowledged in one of our recent interviews, the issue has been flexibility with schemas. There are 2000 partners that Skyscanner works with, and there is plenty to deal with as far as APIs are concerned. “We hope to see more airlines adopt it (NDC),” mentioned Filip Filipov, VP, Product Management at Skyscanner. As Nair explains, certain airlines have realized that the game of retailing isn’t just about flight, air ancillaries such as flight boarding or bags, or hotels and car rental. In fact, airlines are being advised to dig deeper and target the “second wallet”, offering meals, insurance, events, transfers, taxi etc. Some of these products can result in attractive margin, for instance, meals with average order value of $15-$20, and net revenue of $9-$12. But, according to Amadeus, the Level 3 is disruptive for agents, changing workflows and processes. As Cyril Tetaz, Head of Commercial, Asia Pacific, Airlines, Amadeus, explained to us recently, the cost and difficulty of integration remain quite high and may be difficult for some parties to address. Airlines have been largely focused on Level 3 connectivity (Offer and Order Management) that would allow airline offer creation as well as order creation, retrieval, change and travel document issuance, payment and refund to be done via NDC-XML technology. IATA has also been highly focused on providing standards around this. But this represents a major booking flow redesign and requires travel agents to invest in NDC interface adaptation and costly IT integration, according to Amadeus. As Tetaz said, there are many ways of integrating NDC, and Level 2 connectivity (Airline Offer Management) is one of them. Here, airline offer creation through search and pricing of flights and ancillary services would be done via NDC-XML technology, without impacting the booking, servicing, payment and ticketing steps. However, Level 2 connectivity has not yet been defined by any industry player, he said. Options for integrating NDC are still in the making and being discussed by all players. Within the context of NDC, “our vision is to develop an integrated solution that can be widely adopted by both travel agencies and airlines to deliver sustainable results at a scale that matters. The objective is to ensure easy adoption in the marketplace with minimal disruption and to meet the business objectives of all parties. Collaboration across the industry will be a key factor in driving success for all players,” he said. On the positive side, even the certification attained by different stakeholders could vary, specialists have found a way out to get the work done. There are offerings that can normalize different schema versions in real time, enabling connections to work between airlines and aggregators. This has helped in the implementation of NDC. So even if an aggregator could be at different level of certification and an IT player could be at different level, “this is where NDC Adaptors come into play where we make sure that no matter on whichever version they are, we will make sure they are able to talk to each other – backward and forward compatibility,” said Nair. So progress is being made regardless of schema standard and version. As of today, different stakeholders have different take on the maturity level of the NDC standard, and expect such mixed response to continue in the time to come. For an industry that is caught up being process/ operations-focused, being too “siloed”, the task of being a part of a digital economy or embracing new business processes isn’t a straightforward one for airlines. Traditionally airlines have focused on safety and operations, and this means customer-centricity has largely been way below in the list of preferences. But with the race to own the customer largely drifting away to those who “own the data”, airlines are rightly looking at evolution to sector-specific processes, systems etc. to serve the passengers in the best possible manner. The consumption pattern and the fulfilment part of taking travellers from one destination to another is unique, quite different from buying a book online, but airlines can’t ignore consumerism that essentially is now about a connected, contextual experience. 2. Making the most of datafication and IT trends to be a part of a digital economy. Both are equally important as there is no single customer journey. “There will be no single customer journey. In fact, it will be the opposite. We go into the area of hyper-personalization, where each passenger will get a different offering through potentially unique set of channels. Artificial intelligence combined with platform economy allows unprecedented customer flows,” explained Marko Javornik, VP/GM Mobility and Travel, Comtrade Digital Services. Here we explore how airlines are finding a way to serve their passengers by being part of a digital economy, and via industry-specific systems and processes (offer management, OneOrder concept, as envisioned by IATA), ahead of this week's 8th Mega Event Worldwide, to be held in Palm Springs, CA, USA (29 November – 1 December, 2017). Javornik emphasised that digital economy works through a platform economy model. An interesting aspect of such model, according to Accenture, is the frenemy-like set of vertical industry groups “competing with captive offerings of horizontal platforms (e.g. Spotify on iOS vs. iTunes, Netflix on Prime vs. Amazon) is a characteristic of the platform economy”. Good news is that the travel industry is starting to count on computing power, data storage, and open-source frameworks. Whether airlines make the most of datasets in their own environment or find a way to act on the activity of a shopper on Facebook or Alibaba (could be via retargeting or a branded storefront), acting on quality, relevant data must. Being part of such model or ecosystem can help airlines to make the most of where traffic is – it could be Facebook Messenger, WeChat, Fliggy etc. Say, a user ends up having an interaction with a chatbot on an airline’s account on WeChat about a fare from London to Shanghai. 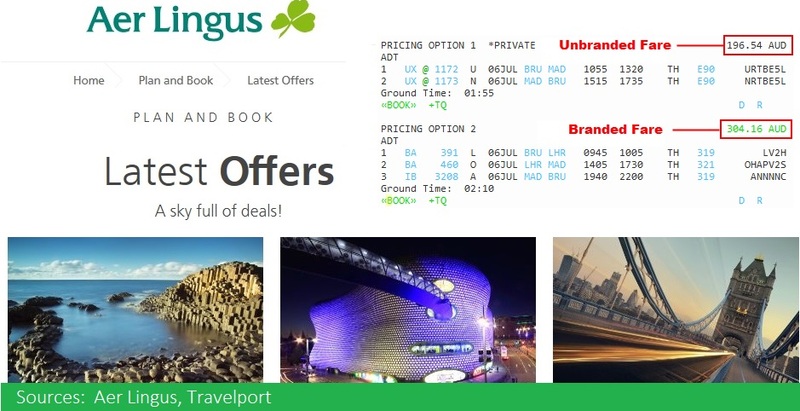 How about showing content (things to do in London)/ deal related to Shanghai when the same user visits airline.com? And if the airline knows about the profile of this traveller, how about offering precise options for things to do or a bundled offer? Plus, contextual signals such as like the time of day, weather, location (if you’re at home or traveling) and style (family, adventure etc.) can even refine recommendations further. This is where preparation in terms of having a single view of the customer, rules-driven content architecture, making the most of content on 3rd party ecosystem etc. can end up delivering a differentiated experience. Airline are looking at the systems they use or processes they are part of to improve upon several counts. One of them is controlling costs (considering the level of the look-to-book ratio as of today). Another area is improving upon KPIs such as average order value. Airlines have a lot of operational systems, for example, seat load factors by routes. So can such systems be fed into merchandising platforms to make offers that are dynamic, on real-time basis? Yes. Also, even though there is a continuous debate around JSON vs. XML featuring in NDC and OneOrder schemas, different stakeholders have gone ahead and allocated resources for the same. This is being done to be in control – making available customized, rich content offers via every sales channel. It is being highlighted that by building on the Offer and Order Management systems, using NDC as the distribution protocol, and creating the One Order standard, airlines will have a much larger pool of APIs and third-party content providers to offer their customers the right travel offer at the right time, regardless if the customer is coming to the airline. As for the OneOrder offering, it would communicate with an airline's passenger services system through industry standard interfaces. The offering running in parallel to an airline’s PSS, would feature complete PSS booking connectivity and document process capability, converting PRN into “orders”. So PSS would pass on information to the NDC platform, where master record would be stored. The blend of this approach counts on historical details provided by the order management system and this vital, real-time business intelligence is leveraged in personalisation of offers. The fundamental concept of order management system is that it becomes the central source of truth. So the airport display, check-in counter, ground handler, catering…every aspect connects to the order management system. This would again help in serving the customer through the journey in an earnest manner. Here from experts at this week's 8th Mega Event Worldwide, to be held in Palm Springs, CA, USA (29 November – 1 December, 2017). Ai Editorial: Personalisation at scale –what’s the journey like? Ai Editorial: How an organization that has embarked on a journey to personalise every interaction is going about the same? Ai’s Ritesh Gupta gains an insight from the travel industry, some dos and don’ts for getting closer to personalisation. Personalisation requires clear vision, resources and investment. From the outset, the roadmap needs to be clear. So how the graph of personalisation is moving along, the entire organisation needs to be aware of. Start with segmentation and make steady progress to rules-driven personalisation. This means setting up and further reworking on business rules that are utilised against clusters of visitors, based on information one can garner about users. This stage is generally based on relatively broader categories – for instance, starting with location or gender specific targeting to an advanced phase like one who has travelled to one particular destination possibly would be interested in another location. Next step before an airline moves onto an analytics-driven phase, could be narrowing down of segments. So a digital touchpoint is equipped to show targeted, relevant content but at this stage personalisation is around logic-based rules to decide on images or videos to be shown to the visitor. One might finalise rules based on the IP address, physical location, keywords etc. Another aspect that has been around is variation in what is being shown to customers on a travel e-commerce website based on the behavior of the user (banking on visitor profiles and pattern-card matching to dynamically alter the content). For this also, rules are finalised. The second major component is progressing toward algorithmic personalisation, where one initiates with a relatively broad set of recommendations to ones that are specifically meant for an individual. It is also interesting to assess how some of the start-ups or 3rd party specialists can also play their part in personalisation, possibly without any access to data from the airline. (For instance, usage of machine learning in personalising destination discovery, helping airlines to begin their customer lifecycle earlier in the inspiration phase which positions them for the booking/ancillaries – that’s where the monetization is). Of course, airlines would be much better placed with a diligent data strategy in place which would help them to work better with such 3rd party specialists, and then they can even go for better recommendations on their websites or apps. · “For any airline to achieve personalisation at scale – the success lies in being able to unite all of their data,” shared an executive. 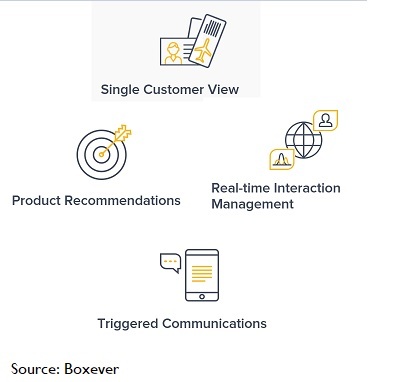 “At some point, the issue of increased complexity would arise, but that’s where involving data science and decision making algorithms would assist.” As highlighted by Boxever, data-driven organisations ensure their customer data collection fits in with constantly evolving behavior based on their context. So if an airline doesn’t end up connecting the dots and act on the context of a situation, then it would end up missing out on optimizing the experience. · Airlines also need to plan for how to set up rules and decisions for all channels, so even if starting with one channel – so say offer or deal for one channel, how the same can be established for all digital plus say offline channel e. g. boarding gate at the airport. · Delivery of content: How would an airline deliver dynamic content, what sort of architecture is needed for the same? Also, what would it take to adopt omni-channel approach to content management? The content ideally needs to be crafted once and the organization should be able to reuse it on multiple digital properties without the need for duplication. Explore the pros and cons of coupled versus decoupled web content management architecture (for instance, in case of coupled architecture while the initial setting up is simple, scaling up is one issue. As for headless CMS can result in freedom while finalizing on a front-end user interface technology say for an app, on the flip side the CX or customer experience ends up being decoupled as well. This would limit the ability to personalize the overall experience). · “Make sure there is at least something to begin with, to personalize – a certain category of products and content to play with,” shared a source. · As highlighted in one of our previous articles featuring Vueling Airlines, do evaluate the cost of implementing personalisation. There is evidence that personalisation is profitable because it drives conversion up, but there is also evidence that it only works when you get it right and only on a highly segmented audience. As a consequence, you have to be careful with the cost, both economic –high investment is needed- and also opportunity cost. Hear from experts about unique challenges that airlines face as they attempt customer-centricity at the upcoming 8th Mega Event Worldwide, to be held in Palm Springs, CA, USA (29 November – 1 December, 2017). Every interaction – be it via app/ website, self-service kiosks or staff at the airport, a chatbot etc. – matters today. Airlines, just like any other e-commerce organisation, are gradually finding ways to work out a single view of the customer. As it turns out, more than any investment, any data-centric platform, any IT-related move etc., it is the entire organisation that has to come around and ensure that every data trail is being capitalized on. Aspects like business continuity or the current organizational structure, including unique challenges posed the way a majority of airlines are run, are seemingly the major roadblocks to being data-driven. Of course, extracting data out of transactional systems associated with airlines is one area that can’t be ignored, too. But equally important is the tendency of airlines not to embrace change. It needs to be countered. Airlines executives themselves are probing critical areas – is it time for airlines to split digital commerce from operations? Is an ecommerce/ digital business sitting under the same roof as operations curbing customer-centricity and data-driven retailing at airlines? Airlines need to take the quantum leap into the future, combating organizational/ cultural defiance, limitation of this industry’s legacy technology and operational silos. · Any change, right from sharing a mission and goals, needs to be top-down driven, with incisive leadership laying a strong foundation. “The executive leadership needs to buy into and own the undertaking of this magnitude. Then push it through the entire enterprise, break down the barriers for the working group to work,” recommends, Blair Koch, Datalex’s CTO and President USA. · Data alone cannot provoke change - rather accessibility, acting on it, customer support, training, incentivizing employees and ending up with the development of a customer-centric culture is key, Barcelona-based RJ Friedlander, CEO of ReviewPro, a specialist in guest intelligence for hotels, told me in an interaction this year. · Count on cloud for time to market, agility and cutting down costs. But this doesn’t need to be confused with the actual delivery of customer-centric capabilities required by an airline. So there is a need to prepare people in an airline. Learning how a hotel company is doing the same, as explained by the Thailand-based hotel company AMARI, various departments need to take the responsibility of collecting data, and in turn, actionable information is being provided to ensure the experience of a hotel guest improves. So, for instance, if a guest who has booked via an online travel agency, the hotel front desk staff is being instructed to collect the email id and being trained to get this guest enrolled into a loyalty program. Similarly, if a loyalty program member has turned up, then the screen (yes, there is an additional dashboard on the screen used by the front desk) would reflect relevant information and offer an opportunity to enhance the experience of this guest. So if a guest tends to stay in a certain type of room or prefers a particular location, then the staff can offer the same to them. So how AMARI is bringing about the change? “We talk everything in terms of a guest or customer profile,” shared Chetan Patel, ONYX’s Hospitality Group VP Strategic Marketing and E-Commerce. “We are moving towards real-time, 1-to-1, personalised, seamless interactions with our guests. That’s the end goal,” says Patel. The company is working on a new platform. As explained by Patel, relevant people in the company are capturing data right from what triggers the search to the next trip, and this entails what people tend to do and what are the opportunities to influence the behavior of the traveller. “The entire journey is being evaluated for our own systems and touchpoints,” mentioned Patel. · What data needs to be collected from each touchpoint? · What system will be involved at each touchpoint? · Where the data will be stored at that touchpoint? · Who will be the owner of that data once is collected? Having an integrated customer profile that combines online and offline data is what AMARI is prioritizing. Each airline has to chart their own journey. There are common challenges, where one can learn from some of the proactive organizations. Interestingly, in a recent post by Adobe, it was suggested that don’t rush to eradicate the problem of silos. Yes there are organizational silos that block departments from being on the same page working toward one goal, but also be careful about pushing for a sudden change. People aren’t going to be responsive to “new jobs, new skills, and new people to work with” resulting from drastic steps. Don’t risk the continuity of teams, it suggested. Referring to marketers, it recommended that focus on collaboration (work out a journey map to help address technology and skills gaps), assess goals (cross-team KPIs that align well) and evaluate the transition plans for overall change management.